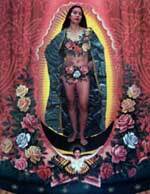 (SANTA FE, NM) -- A collage of the Virgin of Guadalupe clad in a flowery two-piece swimsuit will remain on display at a state-run museum despite protests from some Roman Catholics. A museum committee recommended Tuesday that ``Our Lady,'' by Los Angeles artist Alma Lopez, continue on display at the Museum of International Folk Art. However, the entire exhibit of which it is a part will close earlier than previously scheduled. ``The committee's recommendation will stand unless it's appealed,'' said Tom Wilson, director of the Museum of New Mexico, which runs the folk art museum. An appeal would go to Wilson. She said she thought closing the exhibit early would ``walk a middle ground,'' acknowledging the controversy but without censoring the art. ``I almost see it as the only fair decision for them, to acknowledge that some people in the community were offended, but that the work needed to remain on exhibit,'' she said in a telephone interview from California.